San Diego,California.San Onofre,Camp Pendleton,Oceanside,Carlsbad,Leucadia,La Costa,Encinitas,Cardiff,Solana Beach,Del Mar,Torrey pines,La Jolla,Poway,Julian,San Gabriel River,Angeles Mountains,And The Golden California State parks for lost Gold. I work on a reward basis,This means you can pay me what it's worth to you and what you can afford for me to find your lost item. I enjoy the Good Karma that is in the Search. Born by the beach and grew up in North County San Diego along the coast. I have always been an avid Outdoorsman. Hiking,Camping and Surviving. I am the first person to see it,dig it..it's mine! Over A decade later keeping the beaches clean and Returning Lost sentimental items, (The Best thing that I have found), While Metal detecting on the beach is,Good karma and piece of mind. Timing is everything.I am keen to Find it. Available 24/7 and 7 days a week.Call or text for a fast response and recovery. Thank you so much Curtis Cox it’s great to know there are people like that in this world, that are willing to help with knowledge and equipment to find lost treasure. On Friday I was at south ponto beach in Carlsbad and I took off my ring before I went surfing and left it in my beach chair cup holder and we folded up the chair and it must of fallen out into the sand. I didn’t realize till that Saturday that I lost it at the beach.Saturday evening I went to the beach after I got off work and spent an hour and half sifting through sand with no luck! Before the sun even rose (6am) he showed up and went to work! 40 minutes later he found my ring in the sand! I made it to work as I started at 7:30 A.M.! Thank you so much Curtis! I cannot believe we were able to retrieve my dad’s wedding band of the last 20 years. 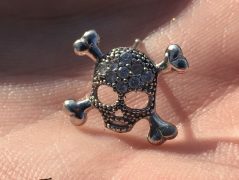 Though it is not his original, it is definitely his favorite and most important piece of jewelry he owns. When the best man forgot the groom’s wedding band behind, my father’s ring was the “stand in” for the ceremony! That is until I the Maid of Honor dropped it into the lake as it was too big on my thumb while I waited to return it to him. I hadn’t slept since the wedding and am so thankful for the internet to connect me with The Ring Finders, and for people like Curtis that are honest, kind and willing to show up at 7:30am with their equipment and skill to help out a stranger in distress. Thank you Curtis for helping my nephew Zach & his new fiance Hannah!! How wonderful that you came to the rescue. This was amazing!! Thank you again!! Eileen. I am Very proud to say Curtis is nothing short of amazing and very gifted. I will be forever greatful and never forget that amazing moment i felt reuniting with my wedding ring. I recommend Curtis to anyone who is in this predicament, you will not be disappointed!! About 6 months ago, my wife Rosie and I were out at Encinitas beach. We were with a group of friends and spent much of the day playing Frisbee on the beach and diving into the ocean waves. I had worn my wedding ring surfing previously with no issue at all and didn’t think to take it off when getting into the water this time. After a few hours at the beach, I suddenly noticed my wedding ring was gone. I had no idea at what point in time I had lost it, but figured it must have slipped off while diving into the waves. Both my wife and I were devastated because we had only been married for about 9 months and I hadn’t even made it a year before losing my ring. 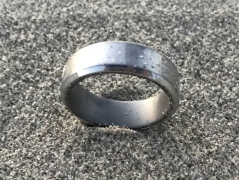 I ended up finding John and Curtis through a local craigslist ad the next day when attempting to see if anyone had posted about a found ring at Encinitas beach. Initially I was very surprised to find that the Ringfinders website even existed and that there were people like John and Curtis who would go out of their way to help others. I gave John a call and he was very responsive and eager to help me out. I met up with him later that day at low tide to go search for the ring and show him where I think I may have lost it. We searched for a few hours scanning the beach up and down but with no luck. At that point, I was fairly convinced that I had lost the ring while out in deep water and that it would never be retrieved. John reassured me that him and his partner Curtis would continue looking and notify me if they found a ring that met the description of mine. A few weeks went by and John had sent me the occasional text reminding me that he had not forgotten about my ring and was still on the hunt. I was grateful to hear from him and know that he had not forgotten. About two months after losing my ring, my wife and I graduated from physical therapy school and moved back home to Seattle, WA. I had already bought a cheaper tungsten replacement ring that was not the same as my original white gold ring, but would suffice. 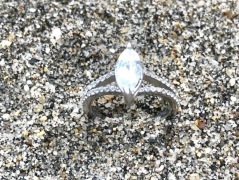 I figured that my original wedding ring was deep beneath the sand in the Pacific Ocean and would never be found again. Then, 6 months after losing my ring, I received a text message from Curtis on Thanksgiving morning. He had been out with his metal detector earlier that morning and found a ring that matched the description of mine. He sent me a picture and it looked similar to mine but was discolored with a yellow hue from being in saltwater for so long. I was still not convinced the ring was mine because it had been so long since I lost it, but Curtis told me he had found it at the same beach. I sent him a picture of the receipt indicating the size of the ring and the width of the band. He checked the size and width and it was a match. He immediately mailed the ring to me so that I could try it on and confirm that it was mine. Sure enough, two days later, I received the ring in the mail and it was indeed mine. It fit perfectly. My wife and I were both astounded. I took it in to the jeweler the next day and had it re-plated and it now looks just as good as it did when I originally purchased it. I could not believe that John and Curtis were able to find my ring 6 months after losing it. What an amazing surprise on Thanksgiving. The even more unbelievable part of the story is that John and Curtis had kept my contact information and remembered me. Six months had gone by and they were still out there searching for my ring. 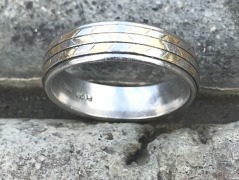 I’m sure it takes a lot of effort to keep a log of where people have lost rings, the ring descriptions, and contact information, but John and Curtis are the best at what they do. I am so grateful that there are people in the world like them. They are willing to take time out of their days and go the extra mile to put a smile on other people’s faces. I cannot thank them enough for what they’ve done or how happy they have made my wife and I. We now have an amazing story to share with all our friends and family and I am finally reunited with my original wedding ring that my wife and I exchanged our vows with. And I owe it all to John and Curtis and their genuine passion for helping others. It’s comforting to know that there are people like them in the world. I would recommend them to anyone in a heartbeat. Thank you both so much for all your help, you guys are amazing. Curtis was amazing, and helped me find the earring. They sentimental value far exceeded the dollar value. They were the set of earrings my husband gave me on our wedding day and I was heartbroken that I had lost one. I had spent our on my hands and knees trying to find it with zero luck. Curtis really did save the day!!! Thank you!!!! While there, I decided to take a dip in the water to cool off. As I walking out of the ocean, I immediately could tell that my finger felt lighter. I looked down and I realized, to my horror, that my wedding band was gone. I was very sad and I knew my wife would be when I told her. When you lose something so small like that in an ocean you don’t expect to ever see it again. My wife was very sad and I could tell she assumed it was gone forever too. We stood on the shore for about ten minutes to see if it had washed up, but deep down we knew it would be impossible to find, so we went home. Over the next few days we talked about how we would save to pay for a new ring while I was deployed. We were both devastated though because the sentimental value of the ring would forever be gone…..
John called me the next day and asked me all about the ring, where I lost it, and other important details. We met with him and his partner, Curtis, on Thursday evening at Carlsbad Beach. John told us that he had a good feeling about finding the ring and that he and Curtis would be searching all night. We were so impressed that these strangers were so willing to help us even just look for the ring. 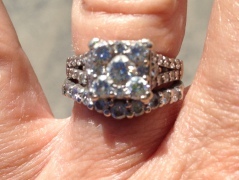 Then to our complete surprise and elation, John called the next morning to inform me that he had found my ring!! It was such a wonderful and happy day. John and Curtis had managed to take on the ocean and give me back such a special possession of mine. We are so truly thankful for their help. These great men even declined our offer to tip them. There are still great people in this world, and John and Curtis are two of those people. Even an ocean can’t stand in the way of true love. 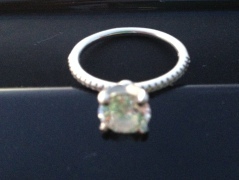 Thank you Curtis Cox and John Hughes for finding my fiance’s engagement ring! You guys are the best. Both of you saved my marriage before it has even happened and a big chunk of change. haha. I had already spent an entire day grid-ding the beach and searching with a metal detector with no luck so I needed some additional reinforcement. I found the ring finders website on an internet search. 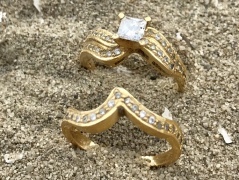 My initial call was to John who in about five minutes came out to the location of the beach where the ring was lost. Sure enough John showed up with Curtis at 6:15PM and we all started searching with no initial luck until Curtis came up with the big find! Stacie and I are so thankful and grateful for both of you and the service you provide. I hope you guys continue helping people. 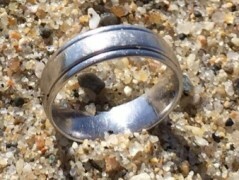 Words cannot express my gratitude to Curtis Cox & John Hughes from Carlsbad theringfinders.com for finding my wedding ring on Carlsbad State beach!!! 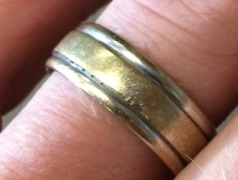 Celebrating 20 years of marriage this year, the ring was irreplaceable to me and something I was sure was lost forever. . . Until I met Curtis and John, my heroes! They were amazing, patient and paid attention to the details that led them right toward the ring. I am forever grateful to them and your directory for providing this service! !